Quarian are a Race in Mass Effect Andromeda. This page will cover the characteristics of this race. The quarians are a nomadic species of humanoid aliens known for their skills with technology and synthetic intelligence. Since their homeworld Rannoch was conquered, the quarians live aboard the Migrant Fleet, a huge collection of starships that travel as a single fleet.Approximately three hundred years before the events of 2183, the quarians created the geth, a species of rudimentary artificial intelligences, to serve as an efficient source of manual labor. However, when the geth gradually became sentient, the quarians became terrified of possible consequences and tried to destroy their creations. The geth won the resulting war and forced their creators into exile. Now the quarians wander the galaxy in a flotilla of salvaged ships, secondhand vessels, and recycled technology. Quarians are generally shorter and of slighter build than humans. Quarians have an endoskeleton, lips, teeth, and two eyes with eyelids and tear ducts; they also have three thick fingers on both hands which include a thumb, an index finger, and a long finger, similar to the middle fingers for humans, as well as three toes on each foot. Quarian facial structure and hair actually makes them the most similar to humans in physical appearance. Their lower legs are bowed backwards significantly, compared to asari or humans. Aside from hands and legs, their general body shape and sexual dimorphism is similar to humans. Male quarians, however, appear to lack a third toe. Their ears or ear analogues differ in a noticeable fashion from those of humans, with references made to "what [passes] for the quarian version of an ear". Also like humans, quarian blood is red.The most distinguishing feature of quarian biology is their weak immune system, compounded by centuries of living in sterile environments. As a result, all quarians by necessity dress in highly sophisticated enviro-suits, to protect them from disease or infection if they are injured. Their suits can be compartmentalized in the event of a tear or similar breach to prevent the spread of contaminants (similar to a ship sealing off bulkheads in the event of a hull breach). Along with their suits, quarians also have extensive cybernetic augmentations integrated into their bodies. 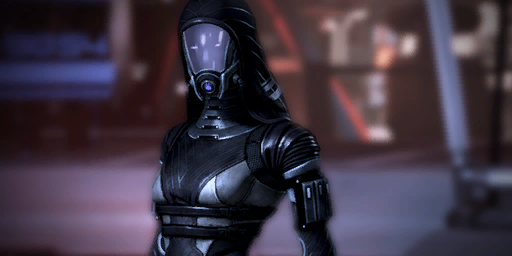 A quarian's lifespan is roughly equal to a human's, but is prone to be less if infection breaks into the suit. Quarian immune systems have always been relatively weak, as pathogenic microbes were comparatively rare in their homeworld's biosphere. Furthermore, what few viruses and other microbes were native to their homeworld were often at least partly beneficial to them, giving them a symbiotic relationship with their environment. After living aboard the Migrant Fleet for generations, the quarians' immune systems have atrophied further still due to the years in the sterile environment of the Migrant Fleet. As such, quarians are given various vaccinations and immunizations to help ward off disease. However, they prefer the safety of their suits even in clean environments and are reluctant to remove them without a good reason. A quarian who wishes to remove their suit must take antibiotics, immuno-boosters, herbal supplements, or the like in order to do so safely, and even then there are inherent risks. As a result, physical acts of affection are difficult for quarians, even for the purposes of reproduction. Ships in the Migrant Fleet often contain "clean rooms" where quarians can give birth or undergo medical procedures in relative safety, though there are always risks. The most intimate thing quarians can do is link their suit environments. However, doing so guarantees a quarian will get sick, although they will usually adapt over time. Like turians, the quarians are a dextro-protein species of reverse chirality from humans and asari. The food of levo-protein races such as humans or asari is at best inedible and at worst poisonous, most likely triggering a dangerous allergic reaction. Quarians who want to taste something (other than the refined edible paste issued to all who leave on their Pilgrimage) can eat specially purified turian cuisine, though the typical quarian diet is vegan, as livestock were found to possess an inefficient resource-to-calorie ratio when stored on the Migrant Fleet. It is implied that other than the oft-mentioned maladjusted immune systems, the quarians have surprisingly robust physiology. Specifically, among Grunt's tank imprints is information on efficient methods of killing other species with simple strikes/pressure on vitals. As a closing comment, he states, "Humans, asari, salarians... all soft. Quarians, not so much." So like, where is the source for this information?